A unique writing instrument for right or left handed use. Custom made, easy flow ball point pen is permanently attached to a molded triangular brace with a solid base that balances and guides the hand as you write. 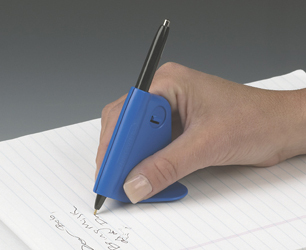 Designed to help improve the handwriting for those with Arthritis, Parkinson's or other hand limitations.